The pdfs are based on a Mix and Gap file containing the text, which is also included below (mtx3). This file provides a wide variety of interactive exercises for use with PCs or with an interactive whiteboard. It requires TaskMagic3. If you haven't got TaskMagic3, you can download a 30-day trial from the TaskMagic website (doesn't require registration or anything - just download and install it). 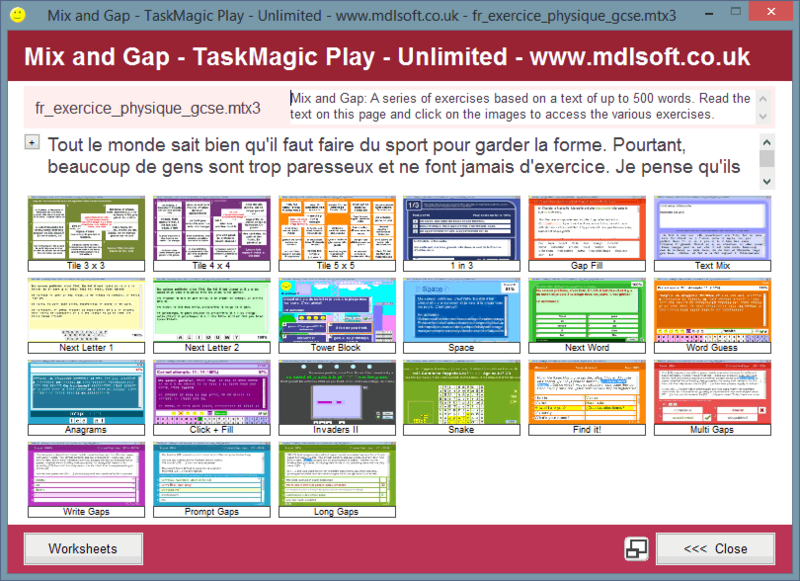 The screenshot above shows the student front page for the file in TaskMagicPlay. In TaskMagic, each of the little thumbnails links to a different interactive exercise. There are 11 pdf files all based on the same text. 3 x tile reconstruction - number in order or cut out and reorder. 1 x separate the words. 1 x find the French. 5 x gapfills: 1 with word list (this is the same exercise as the one featured on the pdf file on the link above); 1 multi-choice; 1 context-only gapfill; 1 verb transform gapfill; 1 with long gaps. These all test students in different ways. 1 x write the French. 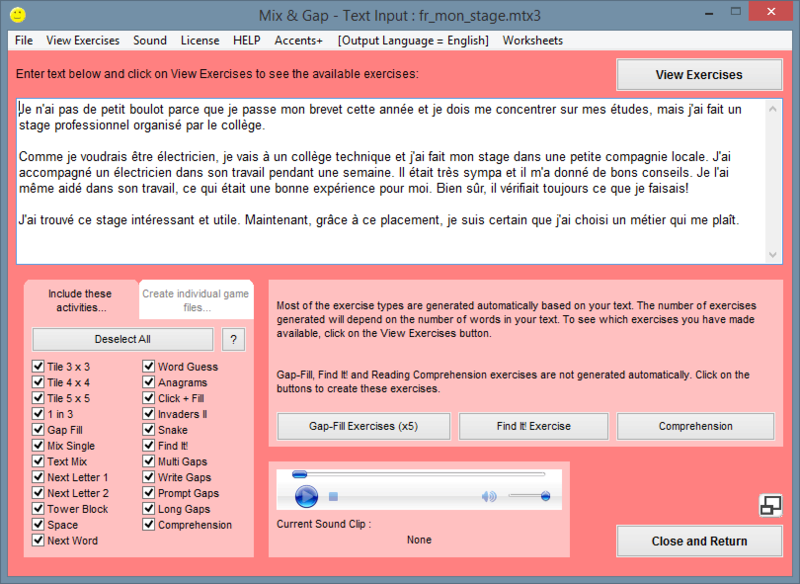 1 x Mix&Gap file (.mtx3) with 21 interactive activities based on the text. 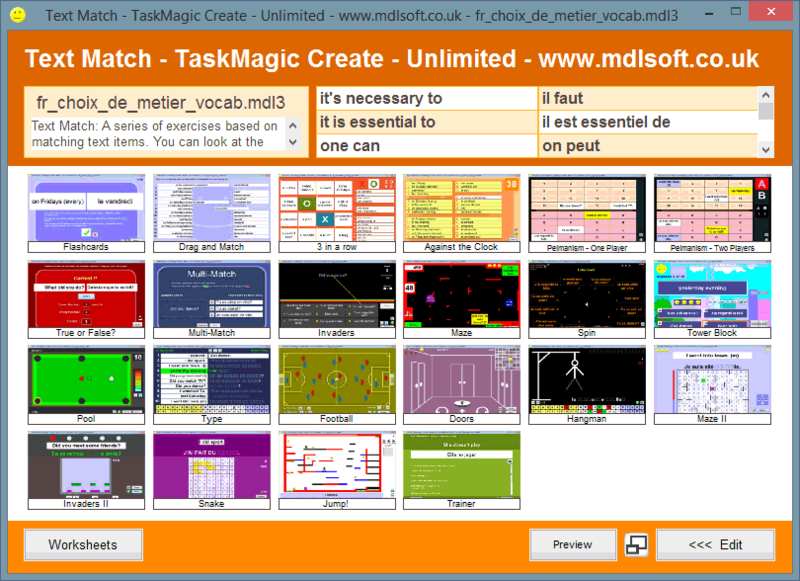 1 x TextMatch file (.mdl3) with 23 interactive games based on the vocab. 5 x gapfills: 1 with word list; 1 multi-choice; 1 context-only gapfill; 1 present tense verb transform gapfill; 1 with long gaps. These all test students in different ways. 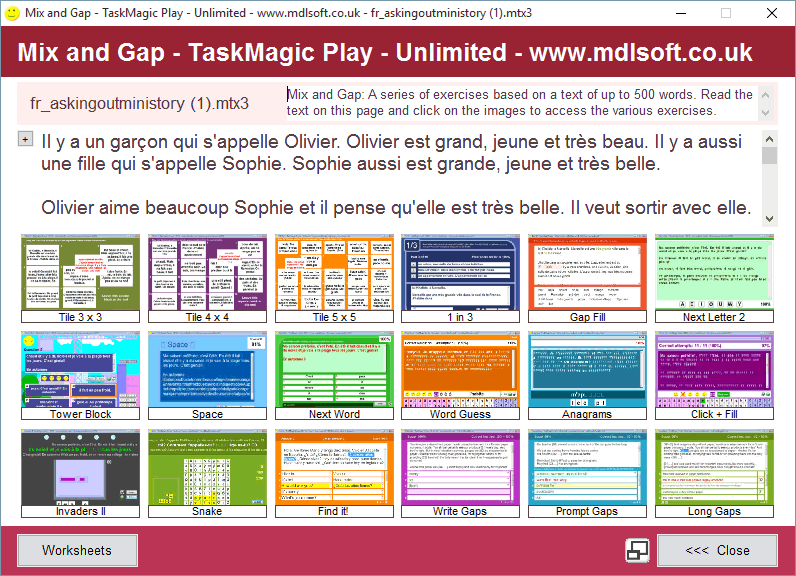 1 x Mix&Gap file (.mtx3) with 20 interactive activities based on the text. 3 x tile activities, where the text is broken down into 8, 15 and 24 tiles. These can be either numbered or cut out and shuffled into the correct order. A multiple choice sequence activity - choose from the 3 options to rebuild the story. 4 x gapfill activities. 1 with word list; 1 based on context only (mainly small words, prepositions etc); 1 transformation gap-fill (similar to the ones on some AS papers); 1 clause length gap-fill. An anagram text activity, requiring students to rewrite the whole text by unscrambling anagrams. Here is the Mix&Gap file used to print all of the above. It contains 18 interactive activities (but requires you to have TaskMagic3). And here are the pdfs, in no particular order.